Last night's comeback was AMAZING! 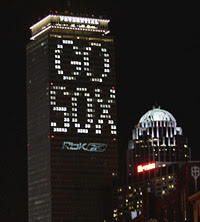 The Sox were down in the series 3 games to 1, making tonight a must win, or they would lose the series. Having lost miserably the last 2 games when I checked on the game tonight and the sox were down 2-0 in the first inning I didn't even sit down to watch the game. We ate supper, cleaned up, bathed the kids and saw the score was 7-0 in the 7th, then the amazing happened... they came back to win the game!! It was so awesome!! You likely know I am a huge Jacoby Ellsbury fan, who is unfortunately in a slump right now, and hasn't played the last 2 games, but he has a blog which is fun to follow. He blogs after each game! Check it out! You won't want to miss Saturday's game at 5pm PDT!! Wow, that's an amazing comeback! But I was too busy watching my Cougars lose last night to pay any attention to baseball. And since the Red Sox beat the Rockies last year in the World Series, I'm not much of a fan! Um, can we stop believin now? The Sox laid a giant egg last night. What happened to our hitters? Oh well, 2 World Series in 4 years is quite a run.